Already having been intrigued, and subsequently surprised, by the Azur 840C player I felt it only natural to investigate the newer offerings of the Azur line, the 840E Preamp and the 840W Amp. They have a lot to live up to, as the player is a pleaser. If this combo would surmount the challenges and rise to the same level of performance, Cambridge would have a trinity of tasty components worthy of consideration by anyone who wants better than average separates or a quality one-brand system. It seems every few years the hot manufacturers swap positions, with newer, cutting edge designs taking the lead. Jockeying occurs even in the middle of the High End pack, where Cambridge holds a solid position. While more recognizable in Europe, the name seems to be gaining ground in America as their gear becomes more upscale in its performance. The Cambridge line is to me a â€œEuropean Parasoundâ€, only a bit less ambitious price-wise. Both have smart designs with respected performance. The Cambridge design team caught the leading edge of a wave with the Azur 840C player, which you are welcome to read more about. Now they are in position to capitalize on it through their preamp and power amp. I will tell you if they succeeded. Just how many features can be packed into a component? One might think that was the driving ambition of Matthew Brambleâ€™s design team. Nearly every conceivable option, and a few that the majority of owners would not have conceived, has been incorporated. I could spend the length of a normal review simply discussing them but I wonâ€™t. Iâ€™ll let the hefty, thorough manuals flesh out the intricacies of the operations while I will point out the salient features to two-channel enthusiasts. Before I leave discussion of the literature, I appreciated the Quick Start guide enclosed with the 840 series components. It is a thoughtful way to help busy buyers get their rig set up. The 840W has another polite gift for purchasers, a low voltage trigger cable and a cable clasp for wrapping up untidy cables; these are signs that Cambridge is thinking about the real world needs of the buyer. Contemporary and clean marks the style of the Azur line. Both the deep charcoal colored player and the brushed silver pre/amps in my possession are simple, but aesthetically pleasing in the way that a crisp dollar bill is simple but enjoyable. Tiny blue LEDâ€™s contrast the wide, strong looking facade. A light gray illuminated display on the preamp matches that of the player. Many functions of the remote carry over between the player and amp; when the amp is selected one can have nearly complete control over it using the CD playerâ€™s remote. Since I had the playerâ€™s remote handy I never bothered using the one for the amp. An â€œampâ€ button on the playerâ€™s remote toggles commands to and from the amp. Even the modular packaging is a thing of wonder; utilization of the same scheme is evident in all three pieces. Some boxes sustained hits en route, but no components were scathed. The Azur series is a statement grouping, displaying Cambridgeâ€™s genius and lavishness in packaging features for the dollar. 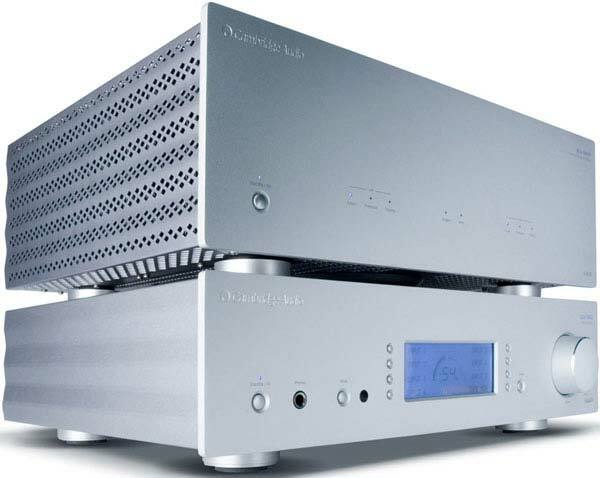 A partnership with Anagram Technologies for the 840C player led to a cascade of development, first with the 840A integrated, then the 840W amp and 840E preamp. Once the amp was finalized, a return visit to the integrated was justified, thus the generation 2 class XD technology was incorporated in the 840A v2. Connections: 12v trigger in/out, control bus in/out, IR emitter in. Great component on great review.